Today's share is a little unique. I found a company through my Pinterest travels that had a wonderful idea to create wall art for new parents reflecting details of their babies birth. The images were created via computer software (if I had to guess I'd say similar to My Digital Studio) but I thought it would be fun to try it the good ole fashioned punch art way! A girlfriend had a baby boy a little over a month ago so I jumped on the chance to put the idea into use. I wanted the image to reflect his room as closely as possible and I think I came fairly close. His room is painted a Smoky Slate color, his furniture is white and his bedding is a multi colored neutral Chevron pattern - pretty neat huh? The view in the window reflects the time of day he was born, the clock on the wall shows the exact time he was delivered, and the calendar is turned to the month, day, and year he was born. 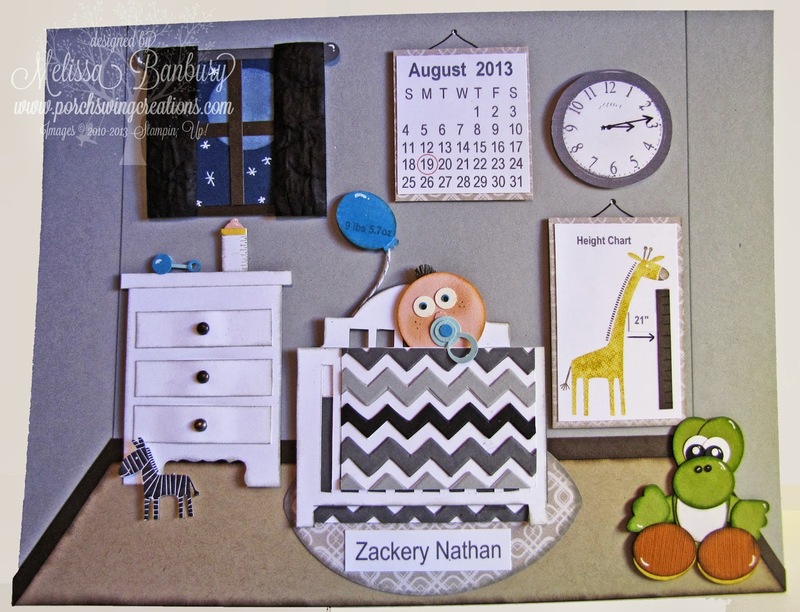 The little floating balloon is stamped with his weight and the little giraffe height chart marks his length. As a finishing touch I added a stuffed "Yoshi" in the corner of the room to represent his very first gift from his big brother. I absolutely love making things like this - it let's me be really personal and a little challenged at the same time (let me just say that the Chevron quilt was a labor of love and patience LOL) plus its such a great keepsake that can be framed in a shadow box and kept out on display in the baby's room. Hope you enjoyed this one! I'll be back on Monday with the promised 'Minion Love' tutorial so check back! Have a wonderful weekend! What an absolutely gorgeous gift for a new baby. I love it and I bet the parents did too. What a cute, fun, unique, special gift. I'm sure the parents apprciate thelove you put into it. They will love it! Adorable! Adorable and such a creative idea! I love it! What a wonderful keepsake! Thanks for sharing with all of us. Thank you for sharing. This is awesome!